This week we added a new feature to Collections Online, our first efforts to map our collection objects, specimens and other resources. As you browse the collection, the Related Places section at the right of the page will generate a map of the places related to the collection item or resource – just click on the “show map” link to open up the map for that page. For Humanities collections we are mapping where an object was made, depicts, was influenced by or refers to. We can map these because we catalogue our collections geographic associations using the Getty Thesaurus of Geographic Names, which often include the latitude and longitude of the place described. That means as we catalogue our collections as part of our acquisition, inventory or research, we are geo-coding the objects at the same time, at least down to the closest geographically named place. There are limitations to this approach, for example it doesn’t go down to street level, and of course many of our collection objects are recorded simply as being made in “New Zealand”, the coordinates for which hover above the centre of the country. Not exactly accurate, but may provide some context for some objects. We’ll try to work through some of these issues, but they are inevitable for some of our objects, as we simply don’t have any more specific information about where they were produced. Places: For the TGN place records themselves, well, we show where the place is! E.g. don’t know where Waipawa is? Now you do! Person pages: Pictorialist photographer Richard Sharrell, born in Graz, Austria, died in Wellington, New Zealand. For Natural environment, we’re using the map references (or more recently GPS coordinates) recorded as part of the collection of specimens on field collection trips. For example, this snail was collected on the Te Ringa track, not far from Russell in the Far North. At this stage we can only map one object, specimen or resource at a time (though they may have multiple places related). Next step is to map multiple specimens, objects etc as this will help understand the distribution of a particular species, or the various places an artist worked for example. We’ll also look at how to try to work with more pin point geo-coding for non-named places, more like what you are used to on Google maps or Street View. But we hope this first step provides at least some more context to the collections and the people and stories that surround them. 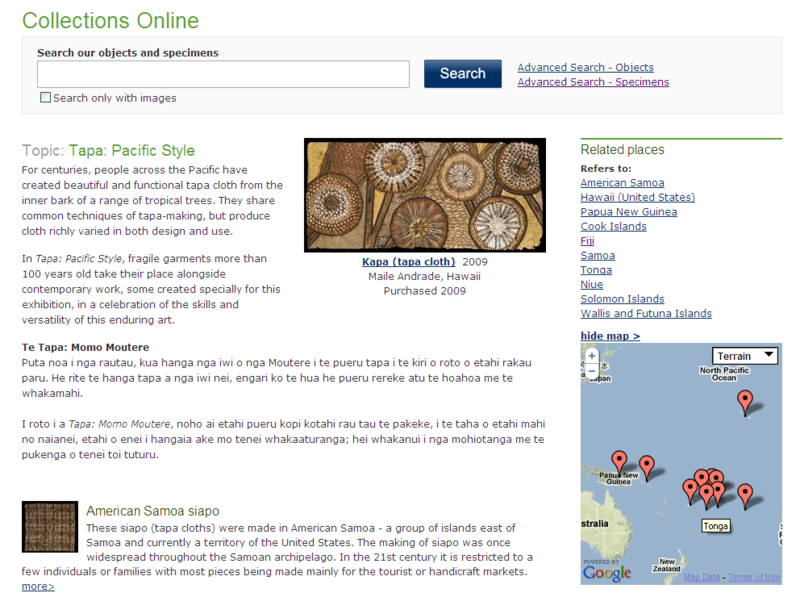 Hi Adrian, My thoughts around linking up with wikipedia would be more in the from of inbound links to the collections. In my opinion doing so would increase the social benefits of the collection many fold. One of my pet hates about wikipedia is the amount of misinformation that can be spread through the articles due to the non professional nature of many of the authors! Wikipedia tends to have been anointed with a very high search ranking by the search engines on subject matter and historical events etc, etc. I reckon that studied and informed people should be writing articles on wikipedia and linking them back into the database so students can follow through to reputable and reliable learning material! And in the process increase the popularity of the online collection, which could in turn increase it’s capacity! Like I said though, just a thought! The links on this page all seem to be broken! This project that you are working on looks really cool! I can see something like this becoming quite expansive. The potential applications are huge. In fact why stop at just mapping the collection? If I might add a suggestion, using historical places of interest revolving around the particular type of article might work for some of the non place specific objects that you’ve got! Just a thought, You could link the collections up with Wikipeadia articles and I reckon you’d have a smash hit on your hands! The educational value of this project to our school children is invaluable. Hi Levi, thanks for the comment and encouragement, it’s always good to hear new ideas and how people are using Collections Online. The links all appear to be working ok so maybe you just came across the problem while the blog or Collections Online was having a few hiccups. Regarding linking to Wikipedia, we currently have a few links to Wikipedia to provide some extra information for some of our People pages (eg Rembrandt van Rijn). We also link to other sites in a similar fashion, such as to the Dictionary of NZ Biography, and other museums and galleries from People pages. However linking out to other websites is something we’re keen to explore more, as we don’t hold all the information, and there are some other great resources out there. We’ve recently implemented some changes to our collections information system to make this happen from more points in Collections Online, so watch this space.